Author Michael Pollan digs through decades of research and plays human guinea pig to illustrate the potential of psychedelics to alter the mind in his captivating book How to Change Your Mind: What the New Science of Psychedelics Teaches Us About Consciousness, Dying, Addiction, Depression, and Transcendence. Click "Buy Now" to own your copy of this summary of Pollan's work today! 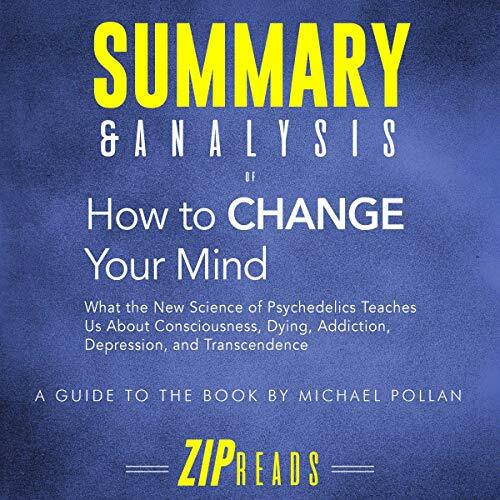 About the original book: Michael Pollan’s How to Change Your Mind is a sober, in-depth exposition of the history and science of the classical psychedelics - LSD, psilocybin, and mescaline. With incredible detail, Pollan brings to life the events that led to the discovery of and mass consumption of LSD, the rise of the 1960s counterculture, and the eventual ban of psychedelic research. He traces the scientists at the forefront of psychedelic research today and relays current findings on the potential of psychedelics to cure addictions and depression, alleviate the fear of dying, and spur spiritual and creative breakthroughs. Anyone curious about altered states of consciousness will find Pollan's book an invaluable read. Disclaimer: This audiobook is intended as a companion to, not a replacement for How to Change Your Mind. ZIP Reads is wholly responsible for this content and is not associated with the original author in any way.